Before I started this space two years ago, I read through several blogs in effort to research the community and the audience that comes along with the territory. In doing so, I stumbled upon a blog from a mother who experienced the unfathomable, the unthinkable, the unimaginable pain of losing her twelve year old son in a tragic accident. Anna from An Inch of Gray told her story with such raw emotion that it drew me in like a warm hug and refused to let go. I couldn’t stop reading. I couldn’t stop myself from moving on to the next post and the next. I couldn’t stop wondering how and where she found the strength to overcome the horrible reality of waking up with your child one day and going to bed that night without them. 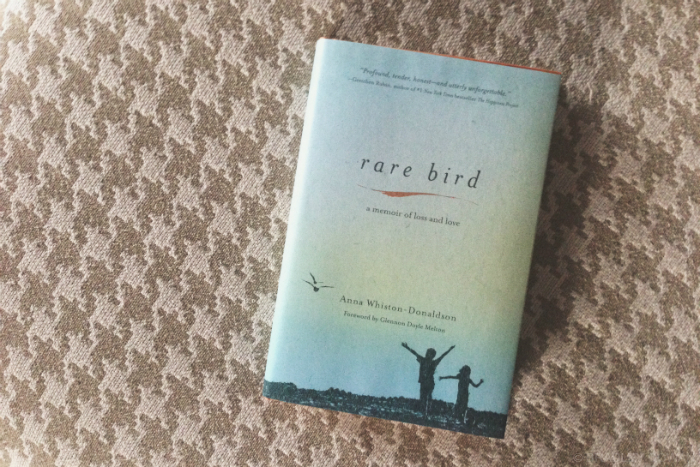 Anna’s gift of faith and hope and the remarkable relationship she has with God eventually found an outlet within the pages of a book called Rare Bird. Released three years after the accident that changed her life in ways no one could imagine, it's the kind of book that stirs your soul. If you have a moment, grab a copy (and some Kleenex)... at the very least stop by her blog. This post was not sponsored in any way. I've been following Anna's blog for a while and believe that her story is one of heartbreak and truth and healing that should be shared with anyone looking to understand the complex language of love and faith and religion and parenting. Thanks for the recommendation! I'm adding this to my list now, and heading over to check out her blog! I hope all is well with you and your princesses lately, my friend. Anna's blog (and book) is beautiful. Hope all is well your way, too!